Superior Canadian gold coins value, excellent 24 karat gold content and overall high consumer interest make Canadian gold coins sometimes a target for gold scams and otherwise dishonest business practices. When looking for Canadian gold coins for sale it’s important to watch out for gold purchase offers that come in the e-mail or from unknown sources. Such offers might result in you purchasing a fake or simply being ripped off by gold scammers. Beware of gold sellers who sell Gold Maple leaf coins at surprisingly cheap prices, there is almost always a fraud behind such transactions. Authentic Canadian Maple Leaf gold bullion coins can not be cheap since they represent the finest Canadian 24 karat gold and come at a price that reflects current spot price of gold with added seller premiums. When buying cheap Canadian gold coins for sale you are likely to receive cheap Chinese fake coins at best or nothing at all. The best piece of advice is to stay away form cheap gold offers or at least pay with your credit card if you are in doubt so you can dispute these charges in case you receive bad product. Quite a few Gold Maple Leaf coins could be currently purchased from various Internet auctions, including EBay. Despite EBay’s safe trading environment and various tools that they have in place to protect buyers, it’s still possible for dishonest sellers to misrepresent their Canadian gold coins for sale by giving erroneous information on coins’ grade or condition, year of mintage and many more factors affecting their price. Try to avoid buying Canadian gold coins for sale from sellers located in China due to the fact that the majority of fake Canadian gold coins come from this country. 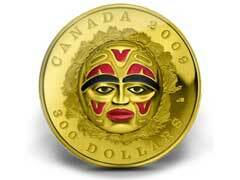 To avoid any kind of Canadian gold scams, stick to well-known and reputable coin dealers or buy directly from mints.